Alex Roberts Artist: Drawing Projects UK - The Figure: Drawing from Life - Re-looking and Reconnecting, May & July 2016. 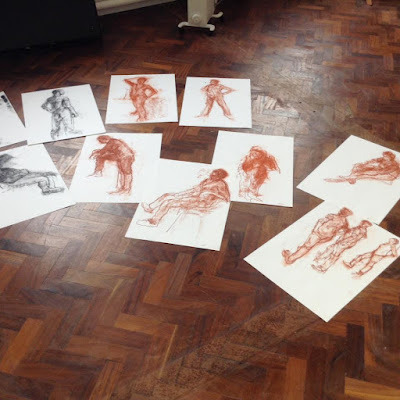 Drawing Projects UK - The Figure: Drawing from Life - Re-looking and Reconnecting, May & July 2016. Weekend drawing sessions... 2 - 3 July 2016 will host another weekend of life drawing with artist Alex Roberts - Analysis of the figure within space, observing human activity by investigating the surrounding location. Following on from the first weekend in May (Reviewing the Model), Alex will lead another two-day drawing session that explores the human form through drawing. The session is tailored to all levels of ability and offers the opportunity to build confidence and to develop and enhance skills through working from observation. A plethora of techniques will be deployed to explore form, shape, proportion and to develop a personal approach to respond to, and re-view, the model. The Drawing Sessions organised by Drawing Projects UK are suitable for adults who wish to test and develop their approaches to drawing through participation in artist-led projects in our dedicated facilities with small group sizes. Participants can join this session for either Saturday or Sunday (11am-4pm) or for the full weekend. Some materials and refreshments will be provided.